This level has medium difficulty. 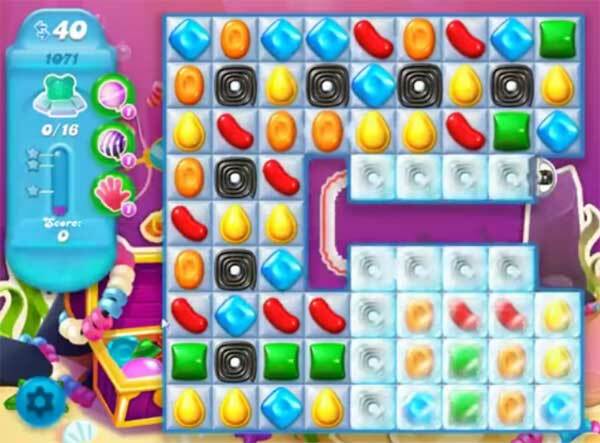 For this level try to play from left bottom part of the board and make special candy as you get the chance. Combine special candies with each other or play near to remaining snow blockers to break them all. ANNOYED!! 1) WHY do you make these levels so hard??? 2) NOT a medium difficulty!! 3) kinda starts out good, but then can’t get ANY matches near blockers 4) can’t reach any of my quests 5) you’d think this level would be easy to get sprinkle and color changers.,NOPE!! 6) My boards NEVER look like the video 7) don’t play much, you want me to play more and recommend the game…I haven’t yet and WON’T with these bull levels!! Am i stupid or what?? I have played this level over 500 times!! 1) my boards NEVER LOOK LIKE THE VIDEO 2) I can’t begin to touch the bottom right corner 3) you get a few matches down there, then nothing 4) WHAT AM I MISSING????? 5) BEYOND BORED!! They have changed the level to add another layer to break through in the lower right corner. Well, this is really frustrating! Have been on this level for over two weeks. Used every booster available with the bonus of 30 minutes free play – can’t even get real close to completing.